Very nice – I do so prefer Misty with a nice neat haircut rather than the branching-tree thing she had a few years back. 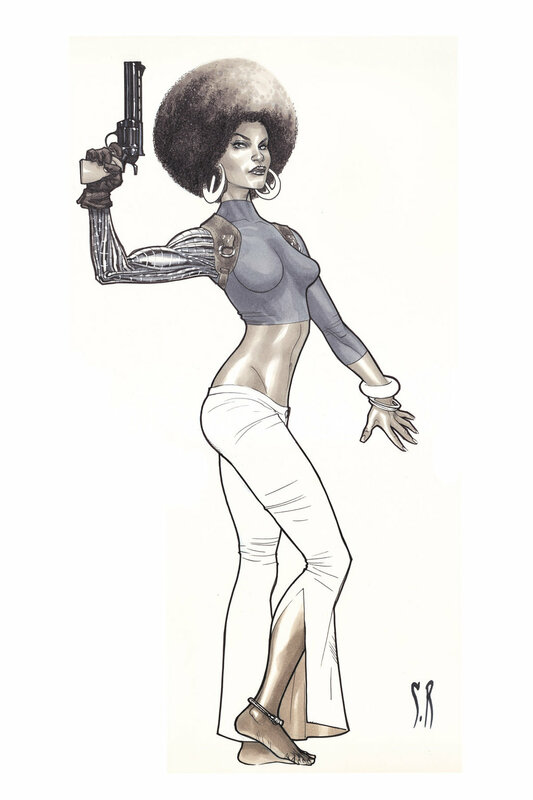 I love Misty Knight! She is just way swift and nifty! I love a lot of what Stephane does, but I have to call him out on this one. It’s not a very good drawing. It’s stiff and the figure looks oddly posed (the arm is extended why exactly?). And he renders Misty as if he’s never seen what a black woman really looks like. I’m not one of the “Ethnic Police”, but without the hairstyle and dark skin, you’d never know she was African-American. People are made differently. Sometimes those differences are obvious, sometimes they’re subtle. I love it when artists (especially comic artists) attempt to accurately capture those things on the page and not generalize everything and everybody. Sorry to be Negative Ned! I agree with you, Swain. Specifically in regards to her body proportions and positioning. I think her face and hair is exquisite, though. Much of Roux’s work has a stiffness to it, too. Check the Dani Moonstar image I posted. It is very pretty, but you can see it in the neck and shoulders. You aren’t being negative! You’re expressing a well-informed opinion and your points are valid. Besides, you know this stuff better than most people I know.